For wildlife enthusiasts, there is nothing better than enjoying the jeep/canter safari in the Ranthambore National Park which is known for a good population of Tigers. 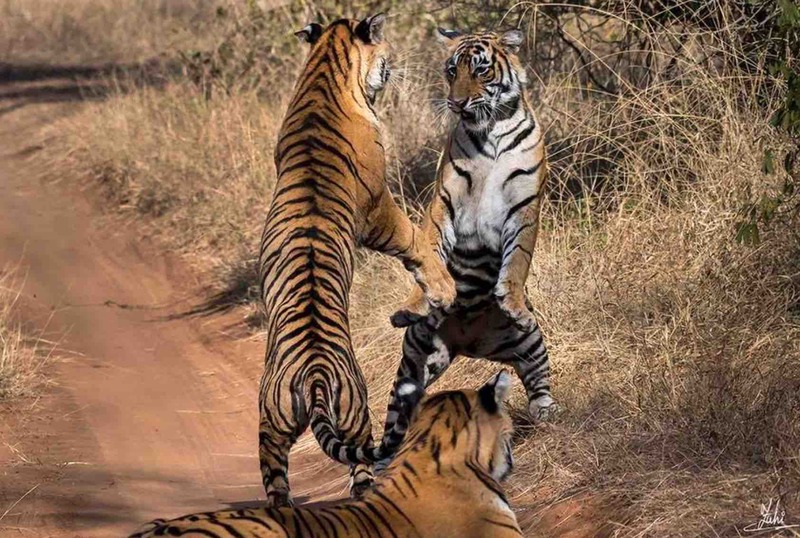 Hence, this park is also known as Ranthambore Tiger Reserve. Some other wild animals like, leopard, chital, blackbuck, deer, nilgai etc. can be spotted in their natural habitat. The safari is organized twice a day in the morning and afternoon. It is better to book a safari in advance since a limited number of vehicles are allowed to enter into the park. Some people prefer to enjoy the safari during the same day Jaipur Ranthambore tour to save their time. In this tour, a traveler can depart from Jaipur in the morning and after enjoying the safari, returns Jaipur in the evening on the same day. For camping lovers, Sam Sand Dunes in Jaisalmer is the best place where you need to reach there by afternoon. Enjoy the camel/jeep safari over the bumpy terrains of dunes while catching the glimpses of splendid sunset. Later, have some snacks with drinks and enjoy the Rajasthan folk dance performance, Kalbeliya dance. A group of men and women perform this dance and wear traditional attire. Post that, relish your taste buds with the Rajasthani food- dal-bati-churma. And now the most awaited moment come to enjoy sleeping under the sky studded with glittering stars. Next morning, wake up with sunrise from the sand dunes and get a breakfast at the camp. In short, camping at dunes is a complete package of fun and entertainment on the lands of Thar Desert which is a lot more than camping experience. You might have heard the name of Amber Fort which is a pride of Jaipur but do you know elephant ride while ascending upon the fort is more exciting and interesting thing to do? The elephants are painted and well-decorated with traditional attire to entice tourists. Upon your arrival at the fort, you will be mesmerized by the majestic architecture and intricate carvings of the fort. You can experience this while enjoying the Golden Triangle tour packages where three destinations are explored in a single tour- Delhi, Agra and Jaipur. This is one of the best tours for first-timers in India. While experiencing the Rajasthan Tour Package, how one can miss the camel safari which is the most famous and exciting thing to do in Rajasthan. Places like Pushkar, Jaisalmer and Bikaner are ideal places to experience the best camel safari of Rajasthan. Watching the spectacular views of the desert is an unmatched experience when you sit on the back of camel. To get a deep insight of culture and traditions of Rajasthan, the best thing to do is explore the rural areas of Rajasthan. In the big cities of Rajasthan such as, Jaipur, Jodhpur and Udaipur, you may not find the authentic old culture but at the rural areas, people still believe in maintain the old traditions. Men wear Dhoti-Kurta and women wear Ghaghra-Choli. You will be amazed by their grand hospitality. So, hire a car in Rajasthan, get set and go to experience the above 5 best things to do in Rajasthan and make the most out of it. Explore India Vacations is the best tour operator in India. We are specialized in offering Golden Triangle Tours, Rajasthan Tours, North India Tours, South India Tours, Special Interest Tours and Same Day Tours in India. Get exotic stay with Car Rental Services. All the tour packages can be customized. Book now!